PHOENIX — Pop star Katy Perry, a former contemporary Christian artist, promoted experimenting with lesbianism during the halftime show during Super Bowl XLIX, singing her 2008 hit song “I Kissed a Girl” to the thousands gathered at the University of Phoenix stadium and the millions watching on television. Perry performed several other songs during the show, including “Roar,” “California Gurls,” “Teenage Dream” and “Fireworks.” During “Roar,” the pop star rode a giant mechanical lion, and during “California Girls” and “Teenage Dream” she was accompanied by dancers dressed in shark costumes. As previously reported, Perry, an evangelical minister’s daughter, was raised in California, and was brought up to avoid secular music and television programs. She began singing as a Contemporary Christian artist at age 15, and released her first national album in 2001. In an interview with CCM (Contemporary Christian Music Magazine), she stated that one her musical influences was Keith Green, who was known to be bold in his lyrical witness for Christ. However, in 2007, Perry signed with with the secular label Capitol Records, and released her first single, “I Kissed a Girl,” which rose to the number one position on the secular pop charts. The popularity of Perry’s single brought continued national attention until she became one of the most well-known pop artists in the secular music industry. Perry’s parents, Keith and Mary Hudson, who attend Jentezen Franklin’s Free Chapel in Orange County, Calif., state that they do not agree with all of the choices that their daughter has made in her music career. According to reports, last night’s Super Bowl generated record ratings, up 4 percent from last year, with over 100 million people estimated as viewing the game, including the halftime show featuring Perry. She was also joined on stage by rapper Missy Elliott. 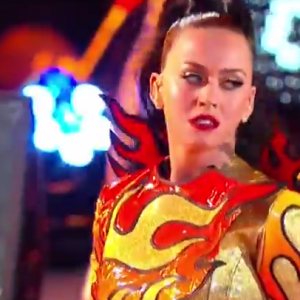 Secular outlets praised Perry’s performance, stating that she “blew away” the halftime show.